your SYS: partition and select "Refresh" from the screen depth-gadget menu or reboot. It is great that this exists and being able to start applications on any screen is super helpful but I really do not believe "The best is that you are able to configure the menu with a simple text file" should be praised as feature. There is a global place for all screen bar module preferences and introducing separate configuration files simply adds unnecessary fragmentation, which is ultimately not user-friendly. ASiegel wrote: " ... I am sure users would find it much more convenient if they were able to simply drag an application icon into a list ..."
I'd have to agree with André on that comment, so it's a +1 from me, for an easier Settings/Config method for this utility. Also, why isn't it listed on your webpage, or the update showing on the MorphOS Storage list, as the v1.0 is on the MorphOS Storage files list, but currently not the v1.1 update? I will add a gui in the sbar prefs for defining the menu in one of the next versions. Just wanted to say that v2.0 of AppLauncher.sbar is out! 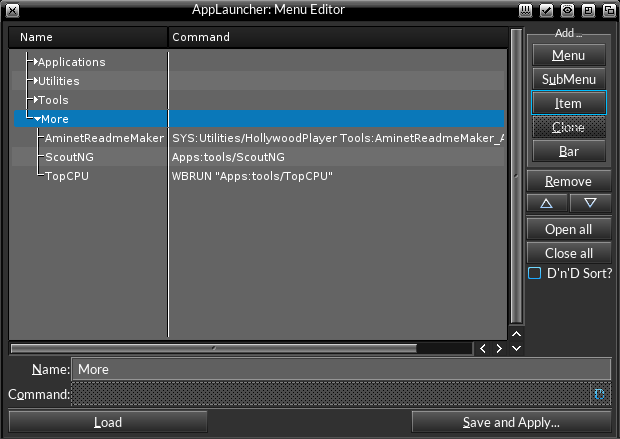 There is now a inbuild menu editor to edit the popup menu and a new sbar and prefs image by André Siegel. You can download it now from here or soon from Aminet or MorphOS Storage. It works nicely for me, the prefs (Menu Editor) have the aesthetic feel of Crabum, I don't know whether this was intentional but it's OK for me. AND . 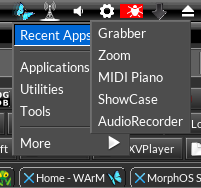 . . it's a nice improvement, including the mini screenbar icon, which is slightly more individual than the Mini-Morpho which can get confusing as we have so many instances of "Morpho" type icons, so something individual like what André has now created "stands out from the crowd". When I try to save the prefs from the Menu Editor, when I'm on a Public Screen, say, for example, OWB's screen, then the "Save and Apply..." confirm/cancel (Yes/No) requester jumps back to Ambient instead of remaining on the screen it's on, so you have to specifically choose to go back to the screen you were on, after confirming/cancelling the save requester, which is a bit irritating. Anyway to fix this issue? I used some code from CRABUM;) but also enhanced it bit. Sorry, for the issue with the Yes/No requester, didn't tested this. I'll fix it when I'm home. One request. Could you add other colored icons? The white squares are almost invisible on my light gray screenbar. Ideally, the icon should be automatically recolored based on whatever font color is used for the top screen bar. This is how all of the internal screen bar modules handle it to ensure their icons remain perfectly legible with a variety of different UI settings. Ok, I see it. It seems to change between black and white squares, depending on the skin I choose. Problem is with some skins like Ferox or Albulus which use light colored background it uses white. Sorry if this is obvious but, is there a setting to change the color font for the screen bar or is it hardcoded to the skin? @emeck, sorry I just did a simple negative on darker screenbars. Now I recolor the sbar image with the screebar's TextPen, like André said. The textpen is hardcoded in the skinconfig file (which you can edit with a normal text editor), but some sbar modules (like yWeather;) let you choose a different color. Here you can download the new v2.1 or wait till it comes up on Aminet and MorphOS Storage. Wow, quickly fixed. Thank you very much! The MorphOS SDK should really feature a skeleton sbar example that includes all the necessary code to both set up proper settings in the global screen bars prefs window and to handle automatically recolored screen title bar icons (and different sizes based on title bar height perhaps). There is no good reason why anybody should reinvent this functionality from scratch and a high probability for non-standard solutions due to a lack of time, etc. Why would it be so much better if the MenuEditor would be in the global sbar prefs instead of an own window? I think it's easier to open the MenuEditor from the popup menu. Why don't you update to the current version 3.11? You need MorphOS v3.11, because I use the new extras.library. I 'installed' version 2.1, and when I click on the SBar icon the SBar is dead for 10 seconds: the title clock is stalled. After 10 seconds the popup menu opens and the systems is reactive again. This reminds me of a similar bug in gTranslator that I reported some time ago. I like the general idea of panels/start bars on various screens, but I mostly miss Ambient's icon bars on all screens. think it would be more useful to make Ambient's icon bars available for all public screens. That offered many more advantages to the user like more flexibilty in orientation, placement, visibility, icon size, screen dependent content etc. Hmm, the 10secs delay isn't normal. On first press the config gets loaded and menu is created, but that shouldn't take 10secs. Is it only the first time you press the sbar icon or everytime? Any hits in the log? Could you maybe have snoopium running while doing this? Maybe you see some delay there. Of which position 1 is logged right away when I click the SBar icon and all the following ones are delayed by 10s. They show up at the same time the popup menu opens. If you want more detailed output, then please tell/show me your desired settings. Hmm, is there also a delay if you deactivate AppLauncher then reactivate it and click on it's icon? Could it be that your sys: partition is extremly fragmented? When I deactivate the module and activate it again, the 10s delay shows up again on next icon click. 'type' command takes 15s to finish. Ok, then there is definitely something wrong with your system. The filesize of the default config is only about 3kb. It should take only about 1 sec or something like that. Then I saved the config. Obviously this created a file of 49.5MB in size which causes the delay. The backup file in fact is 3,319 Bytes in size. If I replace the config by the backup file, the SBar popup menu opens right away. Very strange, could you maybe send me the first MB of that config via email (Thomas@Igracki.de)? Btw, where did you added the new item? Ok, I could reproduce it and found the cause! It doesn't appends the contents of the file it appended lots of spaces! my variable "indent" was 0 and then I decreased it by one (indent--), "indent" then becomes -1! Although its of ULONG type. I thought "indent" would automatically be set to 0, because I decrease a ULONG variable (which is already 0) by 1. I will prepare a new version later, I wanted to add a global hotkey to open the menu via keyboard. Thanks. I confirm that the bug is fixed in v2.2. I tried v2.2, but the HotKey (Ctrl+help) I had to change to something else, as my A1016 Bluetooth keyboard does not have a MorphOS/Amiga recognised Help key on it, (as it's recognised as the Insert key) so by using the sample key I chose, "lshift control a" - once I had changed it I tried it, and didn't realise why it hadn't seemed to work, but then I remembered that any changes to the modules need to be re-scanned, and so it works now. So that's another neat feature, and you can use the cursor, Return and Esc keys to navigate the menu, so it's totally keyboard controllable. So, I like it even more. If you want an updated readme with improved English then just ask, and I'll send it to you via a PM, as it seems to not be recognised as a text file, due to an unrecognised character that's placed just prior to your Last name. The Keyadjust.mui which is used for getting the hotkey doesn't supports notification on changing currently so you have to disable/reenable a module or do a full rescan like you did. It's the same with other modules using this class like Grabber.sbar f.e. I did a bug report for this issue. Concerning your help for improving the English in the readme, yes please! OK, I'll send you the edited/amended ReadMe.txt in a PM ... to follow shortly ............. enjoy !! Currently that link is still for AppLauncher_sbar - v2.2 - soon to be updated with v2.3 - hopefully, but the [LINK] is incorrect/has not been updated as yet. I'll have a look at it, when I'm home. But it's on MorphOS Storage and Aminet.